We’re not in Kansas anymore. That’s pretty obvious. Lately I’ve been doing a lot of research on what’s happening in today’s church. So I thought I’d share. 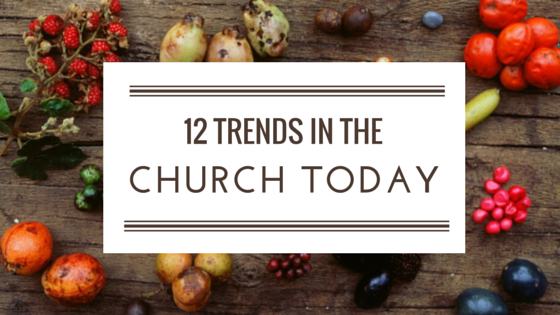 This isn’t an analysis of cultural trends, or a commentary on the church’s capacity to evolve. It’s a sharing of observations, through my own lens, to provoke some thought. There was a time when churches tried to have “something for everyone.” Few churches can sustain that—although some try. But more seem to be focusing on a few key things that they can do well. That may be a certain mission, or youth, or family-friendly ministry, or seniors. More are letting go who they aren’t and focusing on some key strengths. Your strengths are clues to what God will do through you. Your strengths are clues to what God will do through you. Fewer people seem to care (as much) if the church they go to is Presbyterian or Anglican or Baptist. That’s not always the case, but often. Do I resonate with the message and music? And before you conclude that you’re welcoming, ask your atheist friend to show up for church and then tell you about their experience. “People, people who need people.” Yes, I just quoted a Barbra Streisand song. But we are people who need people, and who want to help people (usually). When people are “helpful and hopeful” (to use Kennon Callahan’s words) others want to be a part of it. Oh, and Jesus had a bunch to say about that too. At one time many people thought it was all about “bringing people in.” Now many are realizing (again) that a big part of our mission is to go out and help. Music to worship is like coffee to Canadians: We love it; it gets us jacked up; and you’d better not mess with how we like it! Some churches do traditional hymns well. Some do contemporary songs well. Some do a mix. Each has their style. This doesn’t mean no-hymns-ever or that worship is a rock show. But it means that for many, there’s a significant move in that direction. It has to do with how people hear and make meaning. When you look at the most effective communicators in our day, whether that be Steve Jobs or John Ortberg, they’re not reading essays. They are powerfully speaking inspiring ideas to those who are hungry. Preaching and communicating effectively is a priority in many of today’s healthiest churches. If you’re a pastor and people aren’t remembering or being changed by your messages, you may need to take another look. “You have the greatest story in the world. Trust your material.” Lutheran professor Richard Lischer is right. In a day of moral relativism (that can also creep into some churches), there is hunger for truth. This is not a naive fundamentalism. But a confidence that the Bible is inspired by God; that Jesus is who he says he is; and that he is the Way. Since there is less inherited wisdom about the Christian faith, many churches are focusing on teaching the basics. Things like the 10 Commandments, the fruit of the Spirit, the Apostles’ Creed, the Lord’s Prayer. And it’s often happening in a way that honours questions. If we can’t express our concerns or questions, our growth can be stunted. More and more churches are employing some form of small groups, often meeting in people’s homes. With various church sizes and attendance patterns (see #9) it is increasingly difficult for people to connect, know, support one another, and grow together. Intentional and carefully guided small groups can help with this. This environment also encourages a wider number of people to use their God-given gifts and take a more active role in the church. People spend time online—and that trend is increasing. Canadians use Facebook more than any other country in the world, and seniors are the fast growing group of internet users. It’s not about being “cool.” (There is nothing cool about the internet.) It’s simply about using the everyday tools people use everyday as they live their lives. The reality is that many people who were “every Sunday” people are now “two-Sundays-a-month” people, and those who were there once a month, are now there once every two months. This can be discouraging, but don’t let it be. It’s good to acknowledge a changed reality with double-income families and shift work, more people travelling more often and over longer distances, split-custody families, and sports. Work with the new reality. If you keep hitting your head against a brick wall the brick will win. You can no longer assume that people know the “insider” world of the church or Christian faith. (What is the “narthex” or “justification by faith,” anyway?) The reality is that fewer people know how money or tithing works, who pays the bills, how decisions are made, or the theological basics (see #6). There is, in many ways, a fresh slate to re-teach these things. And that can be a great opportunity. Perhaps we need to drop the “evangelism” title and just call it what it is: Being human. It seems that a growing number of churches are renting space instead of building it. (Or sometimes meeting in people’s homes.) Why? One of the reasons is because bricks and mortar cost a lot of money to maintain when that money is better spent elsewhere. There are real benefits to having a permanent space; but some are going the other way. I think most of us are still in buildings, and there are many people in building projects. But it just needs to be said. Fred Craddock was at a building dedication at the University of Oklahoma and the minister said this prayer: “Lord, burn down this building and scatter these people for the sake of the gospel.” Yowzers. As Sergei Bulgakov wrote, “The Church of Christ is not an institution; she is a new life with Christ and in Christ, directed by the Holy Spirit.” Boom. Looking this over, it can seem kind of mechanical. But there is no magic. You can have it “all together”—but if you have no heart for Jesus or his kingdom none of what you do will matter. Well, it will matter—just in the wrong direction. There are so many things I haven’t talked about like how effective leadership works, or how great churches care for one another. But this blog isn’t about everything. It’s about some of the trends I continually see coming up. But I do want to end with something I firmly believe: Only when we close our eyes to pray can we see God’s vision for our lives and churches. This is true when we are alone, and when we are together as Christians. Only when we close our eyes to #pray can we see God's vision for our lives. In it all, we are wise to get used to being different as God’s people. If we are happy to blend in, then we are happy to die. Previous Post: Forget About “The Problem of Evil.” What About “The Problem of Good”? I think this is a very fair representation of the contemporary church. But I have a question about no. 6. “Trust your material” is one thing, but I wonder about what you characterize as teaching the basics. In my experience, a didactic style is neither especially effective, nor is it characteristic of many successful churches. Many theological observers would say that the age of belief — in the sense that the mark of a “good” Christian was one who knew and believed certain doctrines — is over. Definitely being open to questions is a hallmark of a healthy church, but I wonder why we would be even concerned about trying to teach doctrines whose philosophical underpinnings are so distant that very few people can really explain them? I’m not suggesting jettisoning the doctrine of the Trinity, etc., but the categories of thought just aren’t intelligible today. It’s a defensive statement of faith, guarding against what was eventually labelled as heresy. Not that the common Christian probably understood the debate even then! It seems to me that helping people develop a relationship with the undivided Divine/Jesus/the Holy Spirit — depending on tradition and other factors — is a better starting point. That, I think, is at the heart of the cry from all those who say they are spiritual but not (institutionally) religious. By meeting them there, we all learn to grow in a relationship with God. And, after all, the Trinity is nothing if not about relationship! Hi David, thanks for your thoughtful comment; I appreciate it. When I was speaking about “trust your material” and “teaching the basics” I wasn’t referring to a style of teaching as much as I was the content. The basics are things like the Lord’s Prayer, the 10 Commandments, the Apostles’ Creed, the fruit of the Spirit etc. In terms of what you say about doctrines whose “theological underpinnings are so distant” I’m not sure what you’re referring to. Many of the “old” heresies are still very much alive today. And yes, culture has changed a lot, but the human heart continues to struggle with many of the same things Adam and Abraham and David and Paul did. I would agree that helping people develop a relationship with the Triune God is important—but unless that project is theologically rooted in sound doctrine you’re actually injuring people. Thanks for engaging! Having a clean website isn’t enough now. Perhaps the website has become the “narthex” but the front door is now the mobile version of the site, and we need to be aware of a clean, functional mobile site (not cluttered with words, but clear and concise). But, re the creeds, etc. I’d say that one of the issues would be that you’ve got two contradictory approaches. (And I’m taking this from seekers’ and others’ comments.) You can’t be open and questioning AND have an “I believe” statement. Possibly one could argue for a Pauline creed, but even these are contextual, requiring a a worldview that we simply don’t have today. (e.g. We’re not challenging a Roman demigodish Caesar.) And it’s no slight to say that you can probably count on one hand the number of clergy who understand the roots of East-West, Antioch vs. Alexandria doctrinal divisions of the creedal battles. More fundamentally, I think people are in need of hearing that God is a God of love. Somewhat in line with the point you made in a previous blog about the “problem” of good. A creed that asserts that the Trinity is pre-eminently a way to express that God is one who loves above else and who, therefore, loves all of us and all creation, and seeks to return all of creation to Godself where we will “know as we are known” in a relationship of love that preserves our integrity. Now that’s a unique message, from a religious perspective. Fundamentally, however, creeds, councils and controversies have to do with the head. (They are intellectual arguments, most of the Christian ones born out of philosophical debates that have little or no meaning today. It’s just too easy for people to sling the term Plagiarism around or — and I’m not accusing you of this, semi-Pelagianism — without realizing that it’s anachronistic.) But is God calling us to “think right”? Or is God calling us into a relationship? When we embark on a romantic relationship, for example (and, contrary to some, I think romantic relationships have a lot to teach us about divine love, but that’s another thread) we don’t give a prospective mate a checklist of do’s and don’t’s. We fall in love and gradually we discern. We may have to change some and they may have to change some. And maybe we discover it won’t work, but we still don’t launch into the relationship with a “right way to do things” list. So why do we feel compelled to do this with God? I don’t think God is worried about this. After all, even if one thinks that certain doctrines are unchangeable dogmas, we have to admit that we might not have it completely right. Otherwise, we are assuming that we are God. All of which is a long way of saying that right-thinking is not a concern of mine (and admittedly it once was). I think helping people enter into a relationship with God and discerning God’s purpose for their life and, corporately, discerning God’s purpose and call for the church is what is of paramount importance. Hi David, thanks for your thoughtful response, as always! I won’t reply to everything, but will respond to a few things. You respond quickly to the music question, so I will too. I guess one of the things I would point out is that yes, there are always people who connect with different kinds of music in worship. (I’m one of them.) In my own congregation I know some younger people who like the traditional hymns, and also many older who love the newer praise songs. And I think that we can always find articles, blogs or people who will argue that it’s a mistake to assume all healthy churches are moving to a more contemporary music style or mix. But I think that we often find these points of view and use them as an excuse to not change anything. Not always, but sometimes. What I just wanted to point out was the trend of a move to more contemporary music. It’s simply there and increasingly helping more and more people connect. And keep in mind that there can be solid teaching, mystery and beauty in praise songs too. In terms of creeds you say: “You can’t be open and questioning AND have an “I believe” statement.” I simply disagree. Being “open” doesn’t mean you can’t believe things. In fact, some people who are the most confident in their faith are the most open to having good, respectful conversations with people. Why? Because they don’t feel the need to be defensive. They are confident. By being “open to questions” it means we treat questions respectfully and sincerely. But it is also being open to answers and certainty. I can be open and have a great conversation with someone who is unsure about Jesus and still firmly confess that he is Lord. You raise some other really interesting points too. One being the underpinnings of the creeds and the debates within the early church. I would disagree that they were ‘head’ debates. And in terms of Caesar—he may not be around anymore, but the question about ultimate allegiance and worship is. Further, the reason we have come to know Jesus as Lord (for example) isn’t because it was simply a contrast to Roman Emperor worship; it’s because it’s scriptural and true. These debates and creeds are very much relevant today. When I read through something like the Apostles’ Creed (which consists of summary statements of scriptural insights), every single line has practical and pastoral implications. If “right thinking” drops down the priority list, absolutely everything else in the Christian faith goes. One observation from my own church would be this: We have had several people come to Westminster in the past few years who haven’t been in a church in a long time, perhaps with the exception of Christmas Eve; but they’ve re-connected. When I talk to them they value that they get to use their brains; but they also value that the church is confident enough to take a stand on certain things. One last comment. You write, “even if one thinks that certain doctrines are unchangeable dogmas, we have to admit that we might not have it completely right. Otherwise, we are assuming that we are God.” You’re right in that we never have all the pieces. But that doesn’t mean we don’t have some. And we can still be confident of some of God’s truths and at the same time know that we are not God. So thanks again! I enjoyed reading your thoughts. Perhaps I’ll end with this. At the end of your remarks you say how important it is to help people enter a relationship with God. I agree. But who is God? What is God like? I saw a book that was called “The God I Want.” Now I admit I don’t know what it’s about. But by judging the book by it’s cover (haha), that’s what we’re doing when we don’t take ‘right thinking’ seriously: We’re creating a god we want. We know God by knowing Jesus—the Jesus we find in Scripture. He may not always be perfectly easy to discern, and we may have some of our own biases to confront; but the effort is worth it. Thank you for your reply, Matthew. On the open vs creed point, perhaps I did not express my point well. What I meant was that if someone is questioning, they can’t (so they tell us) say “I believe …” with any integrity. It’s not the believer who should have trouble being open — for sure, I would hope that. But the seeker is being put in an untenable position. As an aside, you say: “Further, the reason we have come to know Jesus as Lord (for example) … [is] because it’s scriptural and true.” But that’s a tautology. For the rest, I think we shall have to agree to disagree. I don’t think we come to “know” God in the broad sense of the word by affirming creeds — especially creeds almost no one understands on the non-historical points. (Sure, you either believe the history or you don’t.) But the doctrine of single or double procession? Further, I don’t believe many people in church create their own god. If they are drown to worship with us, I believe God has called them. It’s the beginning of a relationship. I don’t for a moment think we park our brains at the door of the church. But I don’t think right-thinking leads to a right relationship very often. Lastly, I’d be curious to know what “things” you are referring to when you said some people “value that the church is confident enough to take a stand on certain things.” Poverty, climate change, the plight of and prejudice towards indigenous peoples? Anyway, thanks for the engagement. Just had another couple of quick thoughts. Secondly, I was a little surprised to see that Francis Chan’s church holds to an erroneous (the word heretical seems passé) doctrine of the Trinity. Hi David. Since I disagree with you on multiple levels and this dialogue could go on for quite some time I’m going to now step out of this conversation with this thought—which is rooted in the original point I made in the blog: The evidence is quite simply and profoundly that churches who are growing spiritually and numerically teach the truth. And I would hope all churches “teach the truth,” Matthew. I’ve never been part of one that doesn’t.